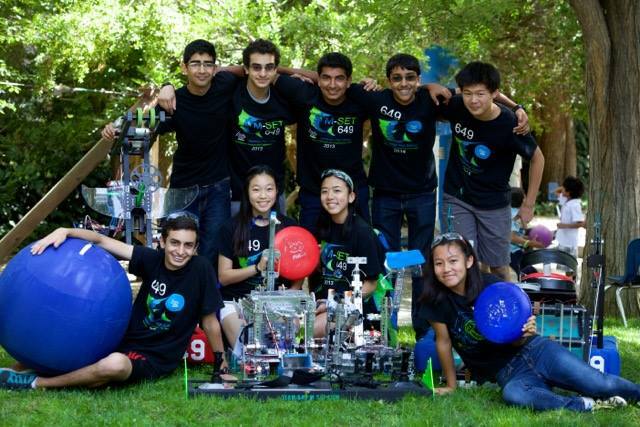 M-SET (Mechanical Science and Engineering Team) is a club at Saratoga High School located in Saratoga, CA. This team is a student community whose goal is to invent with integrity, kindness, respect, creativity, inspiration, teamwork, fun, and trial and error. We work cooperatively with faculty, mentors, and industry to better understand and develop our interest in the science of engineering. We offer a variety of different programs to allow members to flourish in any area they feel particularly inclined towards. Short and intense build period of 6-weeks. No bot modifications allowed at end of build period. Bots are larger, requiring more complex mechanisms and custom parts to compete on a higher level. Season is January through April. Participation Requirements: significantly more hours per week than FTC. Typically expect hundreds of hours especially during 6-wk build period. Recommended that students have prior FTC experience. Smaller team size with limit of 15 students per team. 10-week build period to complete robot but allowed to make modifications up to and during competition. Bots are smaller and built mainly from Tetrix parts. Season is September through April. Participation Requirements: 8 hours per week during regular week; 16 hours per w eek for two weeks prior to each tournament. Recommended for incoming Freshman or if no prior experience.